Vernetti opened its doors in May to Larchmont Village. 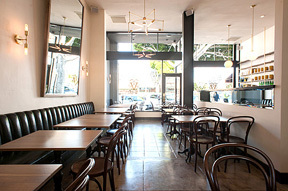 Vernetti, 225 N. Larchmont Blvd., is open. It’s been a long stretch for owners Steve and Johanna Vernetti who went through months of construction and permit delays until the restaurant could open. Vernetti will be open seven days a week serving dinner beginning at 5:30 p.m. The couple, who purchased the 20-year-old Girasole last year to expand and update it into an urban chic eatery, will be adding breakfast, lunch and weekend brunch in a few weeks. The menu includes rigatoni, braised short rib ragu, gnocchi di spinaci, grilled Sea of Cortez and bistecca alla Fiorentina. For reservations, call 323-798-5886 or visit vernetti.la.